Five often-asked questions answered here! When is the best time of year to remove my hummingbird feeder? 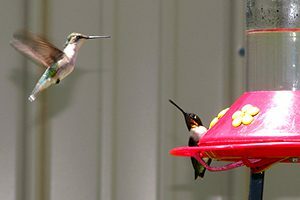 It is best to leave your hummingbird nectar feeders up as long as the hummingbirds are around. A common myth states that leaving up feeders too long will prevent hummingbirds from migrating. That is simply not true. Generally, I suggest leaving feeders up until Oct. 1 in Maryland. If you are still seeing hummingbird activity at that time, leave the feeder up another 1-2 weeks until activity dies down. Very rarely, young hummingbirds will overwinter in the area. Make sure to keep those feeders clean, too! Can I sow wildflower seeds in the fall? Yes! Fall is a great time to sow seeds for many of our local wildflowers. What are the best types of seeds to feed birds? With lots of different types of seeds on the market, it can be hard to choose which will work best for your backyard and local birds. Check out our previous HabiChat on selecting the right seed here. If you feed the birds through the winter, consider signing up and reporting your finds to Project FeederWatch, which begins in November. I want to watch the fall hawk migration but don’t know where to start. Can you help? When and how can I winterize nest boxes? During this time of year, few birds are still nesting. If your nest box is unoccupied, consider winterizing it now.